The first shot of Copenhagen â€” and of the film proper â€” is an aerial view of streets curving into streets, the major arterials of a great city. The term â€˜arterial’ is used advisedly: streets, roads, corridors develop a terrible resonance during Topaz. In those streets, increasingly bustling streets, the defector Kuznetov (Per-Axel Arosenius) and his family are being followed by one of Hitchcock’s mannish women and a couple beefy KGB men. The family crosses a street, disappearing round the end of a parked bus; a second bus hisses flush up behind it, cutting off the pursuers. The Kuznetovs duck into the porcelain factory where women craft the dainty petals and stamens; one daubs pastels onto a white figurine, photographed so closeup that the colors and the whiteness become exquisitely translucent. The daughter looks up from this work of human hands to see a KGB man staring at her. From the china factory the Kuznetovs manage to contact the CIA by phone. It is arranged that they be at a prominent department store at closing time. The American agents wait outside, pretending great interest in Danish newspapers. A bell rings, the store begins to empty of customers and employees. The Kuznetovs emerge, followed by their faithful shadows, who are cut off by the CIA as unceremoniously as by the bus. A car rushes into place. The father and mother run for it but the daughter is spilled, first by a baby carriage, then a flight of rush-hour bicycles. A cry of pain, then up from the street, onto the floor of the car, and out to a twilight field beyond the city where a huge, sleek plane stands waiting. The car is very tiny under one wing of the plane; only one of the two propellers is turning. I don’t know why, but this is one of the most disturbing shots I have ever seen in a film. Machinery is everywhere. There is not only something mechanical about the various government agents but also the rush-hour cyclists too. Airport workers seem only more erratic machines than the gangway they wheel up to the plane. Throughout the film nations themselves are announced by names or insigniae on planes, trucks, ships. Not unrelated is the moment when the Kuznetovs are being driven through Washington, D.C.; an agent points out the White House and the daughter says, â€œIt’s nice.â€ She is separated from it by a blur of bars. But the most interesting machinery in Topaz is understood in terms of an unstated pun, and a rather academic one at that. It is the machinery of plot. 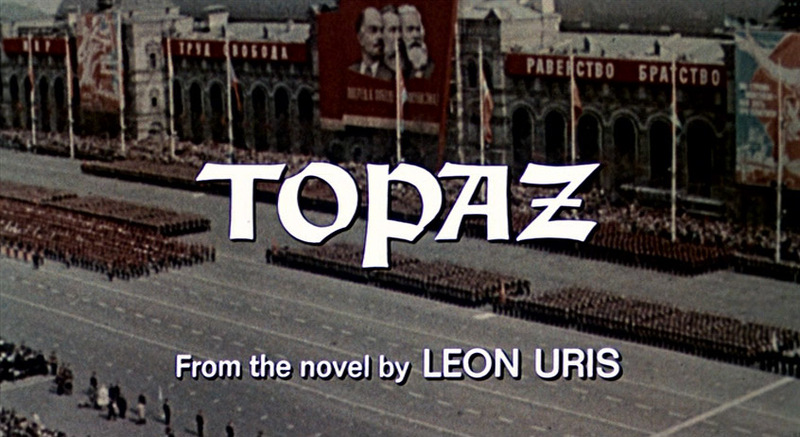 The strange plot- and story-line of Topaz keeps many of the characters from ever confronting one another; indeed, the film is almost totally sectioned into three smaller movies: the first taking place in Copenhagen, D.C., and New York; the second in D.C. and Cuba; the third in D.C. and Paris. None of the characters has a very large view of the circumstances round him or of his own destined role in resolving an international situation. The real, encompassing historical situation is the Cuban missile crisis of 1962 (and more than one reviewer was appalled at Hitchcock’s thickness in failing to realize that, after all, we know how that one came out and therefore could hardly get involved in the movie). Properly, no one character is allowed to dominate the picture. Frederick Stafford (a Continental star of subâ€“James Bond thrillers) is nearly as flat and metallic as his Berlitz accent or fixed expression â€” or his CIA counterpart; this is not a role for distinctive Hitchcock stars like Cary Grant or Jimmy Stewart. The most sympathetic character in the picture is the least informed about what he is doing or why: Philippe (Roscoe Lee Browne) snaps up his Ebony press card and mini-camera, strolls out of his Harlem flower shop, and weasels into the Hotel Theresa to photograph some of the Cuban delegation’s papers at the request of the Stafford character. He does his job wittily, just misses getting killed, and nips back into his shop to put the finishing touches on a lily-clustered cross. On a much less tentative level is the departure of the French agent Devereaux (Stafford), our nominal hero, from his wife in Washington, she accusing him the while of having more than an agent in his chief Cuban contact; the woman is indeed his lover. Devereaux walks toward us, stopping very near the camera with his back to his wife Nicole (Dany Robin); she is distant, out-of-focus. He steps to the side, the camera following him as he picks up something in another room. When he returns to say goodbye, Nicole is gone, and we get a cold, angled shot of landing and stairs in their hallway, themselves a complex of hard angles, and Nicole’s shadow just receding from view. 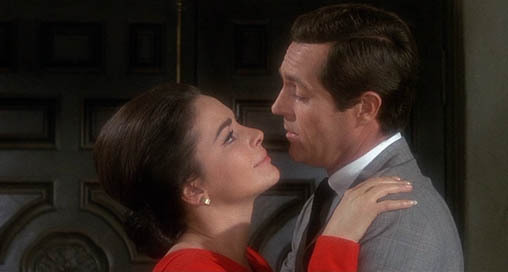 Devereaux will leave Juanita (Karin Dor), his mistress, in much the same way, committing another breach of faith, but unwittingly this time since he cannot know she is in danger from her former Castro allies. This time it is the woman who is down-screen in focus, assuming the responsibility, making a gesture of love that will not be understood till later; and it is Devereaux who hesitates, a tiny, tentative blur, till walking out of the shot and the house and saving his own skin. The break has been anticipated: Even when he and Juanita were first reunited and sat in her boudoir half-undressed, Hitchcock’s method was critical of the liaison: the gauziness of the shot, which might have been sappily romantic in another film, here frosts the scene; jewel-colored liqueurs on the table between the lovers must vie for attention with glinting Bond-style gadgets and Geiger counters; and most importantly of all, the lovers are kept in direct profile to us and in absolutely separate frames, even when Devereaux leans forward to kiss Juanita’s hand. This comes to mind when the screen is later full of the hand of Rico Parra (John Vernon), the Castro lieutenant who had loved Juanita, who learns he has been betrayed by her â€” the hand of Parra pulling the hand of Juanita acrossÂ·the screen, drawing her to him for a final declaration of fatal passion, while Hitchcock’s camera makes an obsessive turn round both of them. There are other links, other memory images: Hitchcock’s camera frames the face of a member of Topaz, the name of the group of French diplomats who have been selling secrets to Russia; the camera leads the face through a door and shifts slightly to pickup another face and thereby identify the master spy, hitherto unknown. Moments later, the same camera movement brings Nicole Devereaux through the same doorway, and when the camera moves on, we already know whose face will be at the end of the shot, who shares this very different rendezvous. The repeated device forces us to recognize the common factor of betrayal â€” in the one instance, political; in the other, personal. The similarity, in Hitchcock’s world, is not stylistically facile but morally essential. To remain unaware of such patterns is to remain unaware of Hitchcock’s film (as many reviewers, national and local, have done, never dreaming that they found Topaz â€œboringâ€ and â€œdullâ€ because they hadn’t seen it). Hitchcock’s method is calculated and exact, but his concern and sympathy is with individual human vulnerability. It is characteristic of Hitchcock’s perversity that he would reserve an especially eloquent portion of sympathy for the blackest villain, who is excluded from the diplomatic circle in one breathtakingly concise rising and descending camera movement. The director leaves exquisite signs of recognition, turning the tiny and political emblem of the Legion of Honor into an abstract red dot, a lifeless correlative of a potentiality for personal pain and loss; and the villains lose more, and more painfully, than anyone else in the movie. 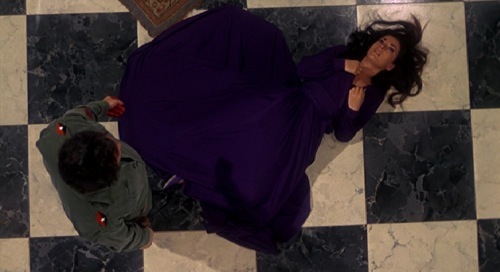 He recognizes the value of life in oblique ways: the perfect counterpoint of Rico Parra’s limpid blue eyes, powerful hands, and rather too plushy thighs as he learns of his mistress’s betrayal; or the pool of purple silk that bleeds her life away in one of the most ravishing images ever realized on film. Or there is the gently shaded light in the room where Devereaux holds diplomatic dÃ©jeuner with half a dozen of his French colleagues, two of whom are his enemies; and the breaking of bread, the splash of wine in a crystal glass, and the too-perfectly controlled actions with which men trim their patÃ© become metaphors simultaneously of the quintessentially civilized life and the politics of betrayal. Alfred Hitchcock’s Topaz expresses more regard for human lives torn in the gears of history and politics than any dozen unscrubbed rants against the inhuman Establishment. Topaz plays through Thursday, August 7 at Northwest Film Forum, as part of the year-long series â€œ69,â€ an exploration of the films of 1969. Edited from a longer, more detailed review that originally appeared in Helix of April 16, 1970. I am grateful to Alan Veigel for his transcript of a recording of Topaz, from which I obtained the exact text of the tour guide‘s speech. And nearly four decades later, may I mention that I returned to Topaz in my essay â€œDinosaurs in the Age of the Cinemobileâ€ for the mid-‘90s Viennale collection Last Picture Shows, subsequently revised and published in English as The Last Great American Picture Show (Amsterdam University Press, 2004).